This image was inspired by the wonderful offerings of the Nightmare Before Christmas tribute show at Galerie Arludik in Paris. I found out about this when Australian concept artist and illustrator extraordinaire Charles Santoso posted his lovely submission on his blog, My Mini Tree House, another inspiration spot worth exploring. Do check out the show's pieces online if you get a chance. They are absolutely delightful! You'll see artwork by Charles, Bobby Chiu, Girald Guerlais, Uli Meyer and so, so many others. 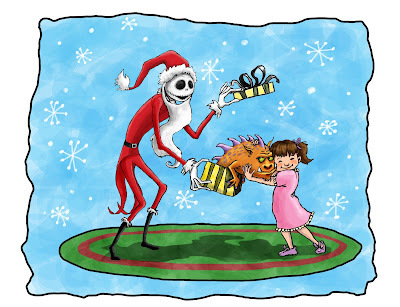 My angle for the above scene was an alternative outcome to Jack Skellington's experiment. What if the kids, instead of being horrified by the presents produced by the Halloweentown crew, were thrilled with the unusual and exotic "toys." Who needs bland Barbie dolls and lame Legos, when you can have your very own toothy, snarling, drooling Groggelyte? Talk about wondrous variety. Many thanks to storyteller Tim Burton for his zany little tale, and to director Henry Selick, who brought glorious life and vision to the film. I am also hosting a one a kind giveaway on my blog! An 8x10 signed and numbered fine art painting by MJ Lindo! Check it out, you won't be disappointed!